Discover Jordan and follow in the footsteps of the Bedouin heritage. This classic tour takes you to the North, East and South of Jordan. In 9 days, the itinerary will cover the most popular sites of the Hashemite kingdom. Starting with Jerash, an ancient Roman city in the north, you will visit Mount Nebo and the castles of Ajloun and Kerak before heading to the South to discover Petra and Wadi Rum, both UNESCO World Heritage sites. A day in the East will be devoted to visiting the desert castles. This morning we visit Jerash, the world’s best-preserved Roman provincial city, built over 2,000 years ago and known as the ‘Pompeii of the East’. Here we visit the Forum, with its forest of towering columns, the arena, where the tracks of chariot wheels can still be seen, the souk area, Temple of Artemis and the South Theatre with its near-perfect acoustics. We continue on to Ajloun and visit its castle, with panoramic views over the Jordan valley. Today, in Madaba we visit the Greek Orthodox Church of St George which has incredible 6th century Byzantine mosaics, depicting Jerusalem and other holy sites. From Madaba we travel to Mount Nebo, the place where Moses looked over the promised land. You will have spectacular views over the Holy Land and the Jordan valley. Next we move on to the Dead Sea where you can enjoy the amazing floating experience in the salty waters of the lowest point on earth. You will spend your third night in your hotel before we move on to Petra, via Kerak and Dana..
Today spend a full day visiting the red rose city of Petra, the biggest attraction of Jordan. You will have a 4 hours guided visit with an official cultural guide, and you will have additional free time to explore areas of the site on your own. Petra was first established around the 6th century B.C. by the Nabataean Arabs, a nomadic tribe who settled in the area and founded a commercial empire. Starting your tour walking through the Siq, the first monument you see is the beautiful Treasury. Walk from here to the Street of Facades, the Royal Tombs and Pharaoh’s Castle, and if you wish, explore further amazing structures including the Monastery and the High Place of Sacrifice. 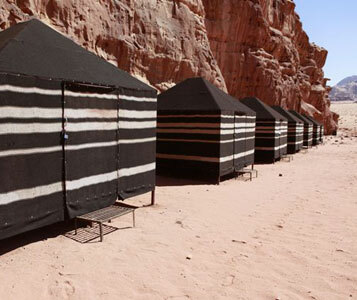 Take lunch in one of the restaurants located within the site itself, and spend a second night in your hotel in Petra. We drive onward to Aqaba, Jordan’s premier Red Sea destination, to enjoy a day of rest and relaxation. Choose to shop in the duty-free economic free zone, watch the world go by from one of the welcoming cafes, relax on one of Aqaba’s golden beaches or rent a snorkel and discover the underwater wonders of the Red Sea where you can see schools of multi-coloured fish. You can even take a trip in a glass-bottomed boat! Dinner at your best convenience ; we recommend you Ali Baba restaurant, famous for its variety of local meals, especially the famous Sayadiyah, a speciailty of Aqaba, cooked with fish from the Red Sea. Overnight in one of our selection of hotels. After breakfast, we drive up to Amman to discover the Jordan capital city : the citadelle, the roman theatre…and you will spend your last night in Madaba. Hotel accommodation 3-4* on BB basis.